SO YOU THINK Champion 3YO Colt in Australia in 2009-10. Champion Miler in Australia in 2010-11. Champion Older Horse in Ireland in 2011 & 2012 (Int.). 14 wins-1 at 2-from 1400m to 2100m, £875,970, €970,425, A$5,734,350, 1,835,000Dhs, Leopardstown Irish Champion S., Gr.1, MVRC WS Cox P., Gr.1-twice, VRC LKS Mackinnon S., Gr.1, Royal Ascot Prince of Wales's S., Gr.1, Sandown Eclipse S., Gr.1, Curragh Tattersalls Gold Cup, Gr.1-twice, MRC Yalumba S., Gr.1, Underwood S., Gr.1, Memsie S., Gr.2, Curragh Mooresbridge S., Gr.3, STC Gloaming S., Gr.3, Freeway Hotel Artarmon 2YO H., 2d Ascot Champion S., Gr.1, VRC Emirates S., Gr.1, Royal Ascot Prince of Wales's S., Gr.1, AJC Ming Dynasty H., L, 3d VRC Melbourne Cup, Gr.1, 4th Longchamp Prix de l'Arc de Triomphe, Gr.1, Meydan Dubai World Cup, Gr.1. He entered stud in Aust. in 2012. Sire of 401 progeny to race, 222 winners (55.0%), earnings of over $20 million, 17 stakes winners, 20 stakes placegetters, inc.
LA BELLA DIOSA (13f, Star Way, Grosvenor). Top Filly on The 2016-17 NZ 3YO Free H (1200m-1600m).6 wins-1 at 2-from 1000m to 1600m to 2018-19, NZ$259,500, A$198,500, New Zealand One Thousand Guineas, Gr.1, ATC Surround S., Gr.2, CJC Canterbury Belle S., L, Ashburton RC John Grigg S., L, MRC Macdonald Family H., 3d CJC Gavelhouse.com S.
NAKEETA JANE (15f, Flying Spur, Nashwan). 3 wins at 1200m, 1400m in 2018-19, A$625,300, ATC Surround S., Gr.1, Light Fingers S., Gr.2, ANZ Bloodstock News H., 2d ATC Tab.com.au H., 3d ATC Randwick Guineas, Gr.1, Flight S., Gr.1, 4th ATC Vinery Stud S., Gr.1. SOPRESSA (14f, Weasel Clause, Buoy). 3 wins from 1800m to 2000m in 2017-18, A$446,220, SAJC Schweppes Oaks, Gr.1, Schweppervescence S., Gr.3. D'ARGENTO (14c, Redoute's Choice, Kenmare). 4 wins-2 at 2-from 1200m to 2000m to 2017-18, A$1,103,525, ATC Rosehill Guineas, Gr.1, Welcome Rydalmere CBC 2YO H., Nelune Foundation H., 2d ATC Epsom H., Gr.1, Theo Marks S., Gr.2, 3d ATC Winx S., Gr.1, Hobartville S., Gr.2, 4th ATC Doncaster H., Gr.1. INFERENCE (13c, Redoute's Choice, Royal Academy). 4 wins-1 at 2-from 1300m to 1600m, A$1,023,200, ATC Randwick Guineas, Gr.1, 2d ATC Rosehill Guineas, Gr.1, MRC Toronado at Swettenham 2YO H., 3d VRC Victoria Derby, Gr.1, MRC Caulfield Classic, Gr.3, 4th MVRC Bill Stutt S., Gr.2. GOLD RUSH (13f, Oratorio, Luskin Star). 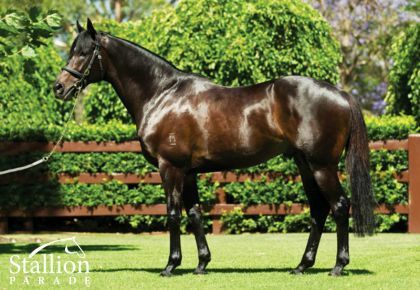 Winner at 2, Matamata Breeders' S., Gr.2, 2d Matamata RC Prima Park 2YO S.
THINK BLEUE (14f, Peintre Celebre, Bletchingly). 5 wins from 1400m to 1700m to 2018-19, A$365,600, MVRC Alexandra S., Gr.3, VRC William Newton VC H., MRC Polytrack H., Clanbrooke Racing H., 2d MRC United Petroleum H.
HIGHER GROUND (14c, Encosta de Lago, Zabeel). 4 wins from 1550m to 2000m in 2017-18, A$226,405, ATC Frank Packer P., Gr.3, Win $10k Cash P., Tab.com.au H., Ribchester New to Darley H., 2d BRC Rough Habit P., Gr.3, ATC McGrath Estate Agents Qld P., 3d ATC TAB Rewards H.
HEAVENLY THOUGHT (14g, St Covet, Lyphard). 3 wins from 1300m to 2200m in 2017-18, A$265,696, BRC Grand Prix S., Gr.3, MRC Ladbrokes Info Hub H., Polytrack P., 2d BRC Queensland Derby, Gr.1. THE PINNACLE (13f, Danehill, Shirley Heights). 3 wins at 1400m, 1900m to 2017-18, A$276,575, ATC Epona S., Gr.3, National Jockeys Trust H., Theraces H., 2d ATC Aspiration H., Gr.3, Gold Coast Bracelet, L, ATC Theraces H., 3d ATC La Boheme Pinot Noir Rose H., Heritage Centre H., Derucci H.
NORTHWEST PASSAGE (13g, Danehill, Machiavellian). 5 wins from 1300m to 2500m, A$371,850, Moonee Valley Night Cup, L, TRC Hobart Guineas, L, Tasmanian Derby, L, ATC Theraces H., 2d Geelong Cup, Gr.3, 3d NSW Tatt's RC Theraces H., 4th VRC Bart Cummings H., Gr.3, Hawkesbury RC Rowley Mile H., L.
CARE TO THINK (13g, Hussonet, Danzatore). 6 wins to 1400m to 2017-18, A$876,425, GCTC Magic Millions Cup, RL, BRC Buffering P., Qld Tatt's RC Winning Edge Presentation H., ATC TAB Highway H., BRC Congrats Jim Roberts 30 Yrs P., 2d ATC Liverpool City Cup, Gr.3, SCTC BOQ Mooloolaba H., Ipswich TC Free Fair Ground Monday H.
MARATHON MAN (14c, Smart Strike, Verglas). 4 wins-1 at 2-from 1800m to 2000m to 2018, €121,630, Longchamp Prix Jacques Laffitte, L, Chantilly Prix du Centre d'Entrainement, Cagnes-sur-Mer Prix du Languedoc, 2d Longchamp La Coupe, Gr.3, Deauville Prix de l'Aigle. FASIKA (15f, Redoute's Choice, Machiavellian). 3 wins at 1200m, 1400m in 2018-19, A$165,500, ATC South Pacific Classic, L, ANZ Bloodstock News H., Championships on Sale P.
GLOBAL THINKING (14f, General Nediym, Spinning World). 3 wins-1 at 2-from 900m to 1600m to 2017-18, NZ$84,100, Southland Guineas, L, BOP RC Gartshore H., 2d Otago RC Dunedin Guineas, L, 3d Whangarei RC Bear Morgan at Harcourts H., 4th Whangarei RC Northland Breeders' S., Gr.3. SO SI BON (13g, Lonhro, Danehill). 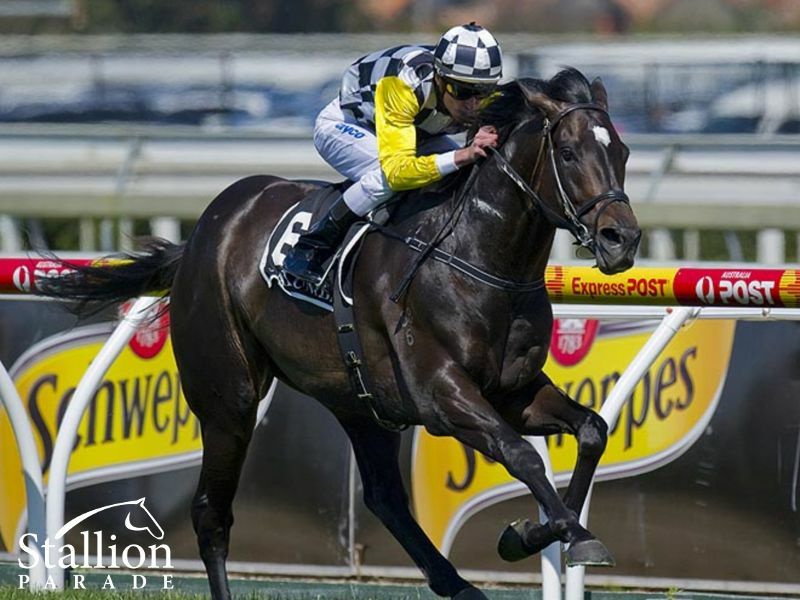 2 wins at 1200m, 1700m to 2018-19, A$619,400, MRC Lord S., L, 2d VRC Blamey S., Gr.2, MRC Heath S., Gr.3, VRC Nominate Now for All-Star Mile H., Eugene Gorman 2YO H., Member Charles White H., 3d ATC Rosehill Guineas, Gr.1, MRC Sir Rupert Clarke S., Gr.1, Moonee Valley Vase, Gr.2, MRC Village S., L, VRC C Hayes AM, OBE Hall of Fame H., MRC Ladbrokes National Jockey Trust H., 4th VRC Victoria Derby, Gr.1, Australian Cup, Gr.1, MRC Zipping Classic, Gr.2. QUICK THINKER (16c, Al Maher, Canny Lad). Winner at 2 in 2018-19, ARC Champagne S., L.
So You Too (13g, More Than Ready, Danehill). 6 wins to 1300m to 2017-18, A$292,290, SAJC Seppeltsfield H., MVRC Strathmore Flowers H., SAJC Evright H., Akeed Mofeed at Goldin Farms H., Gawler & Barossa JC Coopers Session Ale H., 2d SAJC Campolina Stud H., Fleurieu Milk Company H., Sevenhill Cellars H., Schweppes Oaks Raceday H., 3d SAJC Euclase S., Gr.2, MRC Italktravel S., L, SAJC Redelva S., L, SA Derby Raceday H., Matt Tarrant Magic H.
Miss Siska (13f, Is it True, Marscay). 6 wins from 1200m to 1700m to 2018-19, A$312,660, Bendigo Bracelet, MRC Beveridge Williams H., Gawler & Barossa JC 1847 Wines H., 2d VRC Matriarch S., Gr.2, SAJC Medallion Homes H., 3d VRC TAB App Trophy, 4th ATC Queen of the Turf S., Gr.1. Kaching (13g, Desert Sun, Simonstad). 4 wins from 1400m to 1600m to 2017-18, A$169,910, 2d MRC Blue Star Print H., 3d MVRC Bill Stutt S., Gr.2, MRC National Jockey Trust P., Mypunter.com H., Mitavite Summer Challenge Heat H., Blue Star Print Group H., MVRC Dominant Laundry Systems H.
Light Up the Room (15f, Redoute's Choice, Woodman). 3 wins-1 at 2-at 1200m, 1350m to 2018-19, A$149,025, BRC Ray White Ascot H., Aitkenvale Family Health H., GCTC Membership Renewals Now 2YO H., 3d BRC Vo Rogue P., Gr.3, Qld Tatt's RC Winning Edge S., L, BRC Sunfresh Linen H.
Mr So and So (14g, Danehill, Nureyev). 3 wins at 1400m to 2018-19, A$81,100, HK$2,975,050, HKJC Shek Mun H., Salisbury H., 2d MRC Autumn S., Gr.2, 3d MRC Autumn Classic, Gr.2, HKJC Canmake Tokyo H., 4th VRC Emirates Airline H., L.
I Thought So (13g, Fusaichi Pegasus, Don't Say Halo). 3 wins at 1200m to 2017-18, A$279,425, ATC Elite Haulage H., Glen Miller H., Casino Prince at Vinery H., 2d ATC Razor Sharp H., L, Gosford Guineas, L, ATC Man Shake H., Snitzel H., E-Group Security Sprint H., 3d BRC Fred Best Classic, Gr.3, VRC Mss Security Sprint H., L, ATC June S., L.
Neguev (14g, Bering, Nureyev). 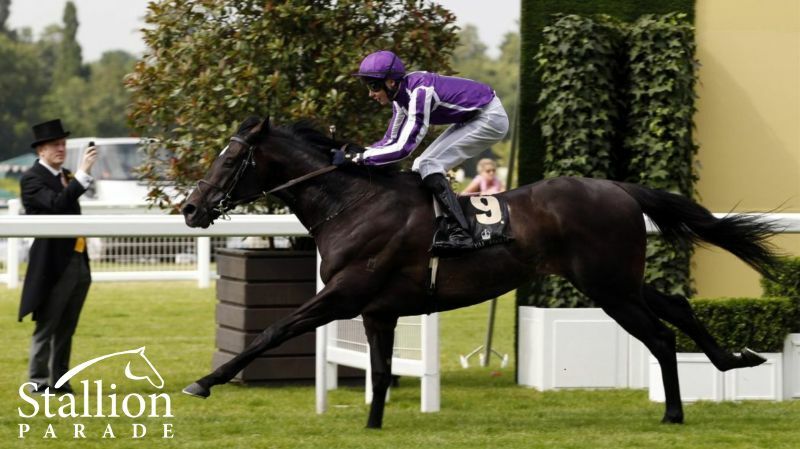 2 wins-1 at 2-at 1600m, Deauville Prix de Saint-Pierre Azif, 2d Deauville Prix de l'Ane a Theme, 3d Maisons-Laffitte Prix Daphnis, Gr.3, Chantilly Prix de Seugy. Coral Coast (14f, Postponed, Kaapstad). 2 wins at 1600m, 2050m to 2018-19, A$100,440, BRC Memberships P., 3d ATC Gloaming S., Gr.3, 4th BRC Queensland Oaks, Gr.1, The Roses, Gr.2. Smart as You Think (13f, Giant's Causeway, Rainbow Quest). 2 wins at 1600m, 2050m to 2018-19, A$336,325, MVRC LF Sign Group H., ATC Kogaroo H., 2d SAJC Morphettville Guineas, L, VRC Akke Van Den Dolder H., SAJC Peroni H., Cranbourne TC Pinker Pinker P., 3d SAJC South Australia Fillies Classic, Gr.3, VRC Anzac Day S., L, MRC Ladbrokes Australia 2YO H., VRC Battle of Coral-Balmoral H., MRC Thebigscreencompany.com H., Mitavite Challenge Heat 3 H., Bairnsdale RC Bairnsdale Cup, 4th MVRC WH Stocks S., Gr.2, SCTC PJ O'Shea S., Gr.2, Ipswich Cup, L.
Harvestfortheworld (15f, Machiavellian, Sadler's Wells). Winner at 1m in 2018, 3d Curragh Gallinule S., Gr.3. Albertville (15f, Big Shuffle, Aspros). 3 wins at 1200m, 1400m in 2018, Dresden Bwin BBAG Auktionsrennen, 3d Chantilly Prix de Saint-Cyr, L, Hoppegarten Hoppegartener Sparkassen Sprint Cup, L, 4th Hoppegarten Westminster Fliegerpreis, L.
Coachwhip (14f, Linamix, Rainbow Quest). 3 wins at 1m, 8½f to 2019, 2d Golden Gate Golden Poppy S., L, Miss America S., L, 3d Fair Grounds Albert M Stall Memorial S., L.
Closer Still (15f, Oasis Dream, Danehill). 2 wins at 2, 2d Gulfstream Park Ginger Brew S., L, Woodbine Star Shoot S., L, 3d Belmont Christiecat S., L.
SO YOU THINK (c by High Chaparral (Ire)) 14 wins. See below. Now You Know (g by Elusive City (USA)) 3 wins at 1400m, 1600m, A$109,818, MVRC Rotary End Polio H., MRC Premier Signs H., 2d ATC Carbine Club S., Gr.3. Hip Hip Hooray (g by Tale of the Cat (USA)) 6 wins at 1200m, 1400m, A$5,000, HK$2,316,450 in Aust. and HK, HKJC Jilin H., Swaine Cup H., Elderly & Youth H., Leiria H., Miho H., 2d HKJC Haikou H., Yan Chai Trophy H., 3d HKJC Holy Grail H.
Tycoon Jack (g by Last Tycoon (Ire)) 3 wins at 1600m, ARC Answer Services Autumn H., Avondale JC Vegie World H., Mr McGerkle H., 2d CJC Millennium Hotel Christchurch H., BOP RC J Swap Contractors H., 3d ARC Coca-Cola H., Avondale JC Auckland Owners Cup. FAALTLESS (g Faltaat) 8 wins at 1100m, 1200m, S$611,499, Singapore TC Garden City Trophy, L-twice, Kindness S., Kranji A S., Initiation P., Huat Chai S., Class 3 H., Class 4 H., 2d Singapore 3YO Sprint, L, Singapore TC Luzerne Cup, Class 4 H., 3d Singapore TC Landex Cup, Magnanimity S.
Scholarly (g High Chaparral) 5 wins from 1600m to 2050m, A$105,420, to 2017-18, MRC Mitavite Summer Challenge H., Annie & Sid H., Le Pine Funerals H.
Trigonometry (g by Galileo (Ire)) 2 wins at 1400m, 2d VRC Dowling Forest H., 3d MRC Show a Heart H., SAJC Top Cut Distance H.
Capucine (f High Chaparral) 3 wins at 1200m, 1400m in 2017-18, Hawkes Bay Livamol H., Waikato RC Sensortronic Scales H.
Packing Chaparral (g High Chaparral) 2 wins at 1600m, 1800m, 2d Waikato RC Allied Security H.
Peak Performer. Winner at 1100m in NZ. Ready Again. Winner at 1400m in Aust. Palaios (c by Medaglia d'Oro (USA)) Placed at 3 in Aust. TRIASSIC (f Tights) 3 wins. See above. Rhapsodic. 7 wins to 1300m, A$133,780, AJC Forrester Welter H., STC Hunter Welter H., Canterbury Welter H., AJC Just Topic H., Tod Sloan H., STC Rotary Community Services Series H., 2d AJC Kingster H., Carramar Welter H., STC Port Jackson Flying Welter H., AJC Dunkirk H., STC Carnation H., Always Welcome H., Nsw Taxi Industry H., 3d STC Topmast Flying Welter H.
Astral Row (f Long Row) 6 wins. See above. 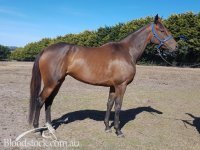 Tristram's Girl (f Sir Tristram) 4 wins from 1200m to 1600m, AJC John Edmondson VC H., Valicare H., Sun Herald H., 2d VATC Norman Robinson S., L, 4th AJC Surround S., Gr.3. Producer. RED CARD (f Red Tempo) 8 wins from 1200m to 2300m, Otago RC Dunedin Gold Cup, Gr.3, Gold Cup, 2d Otago RC Kevin Smith Stayers H., Dunedin City Ford H., 4th Southland RC Invercargill Gold Cup, Gr.3. Producer. 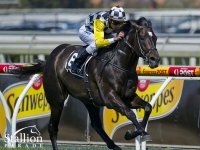 SUPER REVENIR (g Lord Revenir) 9 wins from 1200m to 2300m, A$140,550, STC Premier's Cup, L, BTC Manikato H., 2d Clarence River JC Grafton Cup, Gr.3, AJC Gregory Blaxland H.
Race Record: 23 Starts 14-4-1 £875,970, €970,425, US$0, A$5,734,350, 1,835,000Dhs. 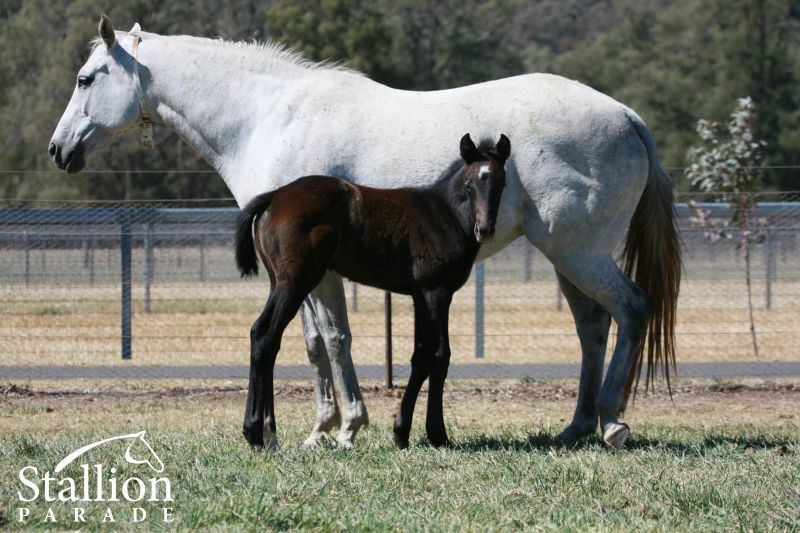 Champion 3YO Colt in Australia in 2009-10. Champion Miler in Australia in 2010-11. Champion Older Horse in Ireland in 2011 & 2012 (Int.). Timeform 133 – Higher rated than the likes of Pierro, Sepoy, It’s A Dundeel, Starspangledbanner, Zoustar etc. “Few stallions have retired to stud in recent years with better credentials than So You Think. 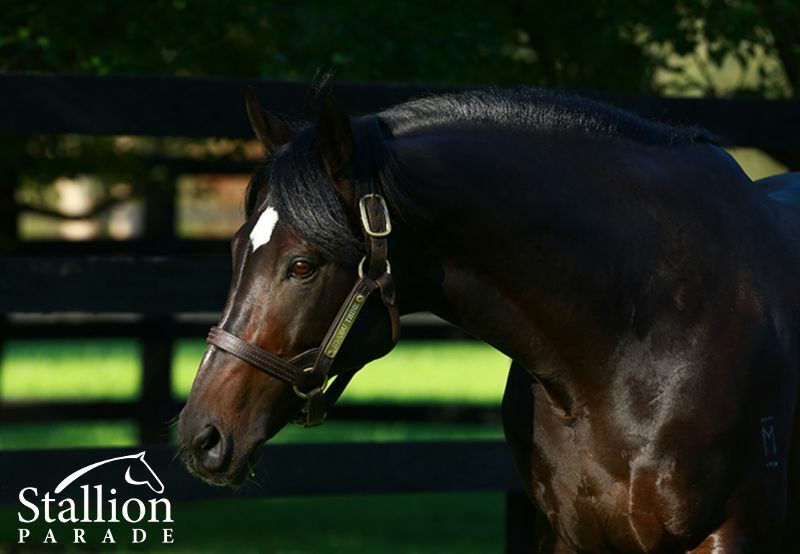 The magnificent black stallion is a 10-time Group 1 winner, probably one of the most handsome horses any of us has ever seen, and a son of a Group 2-winning mare, Triassic. He is clearly very likely to be a successful stallion, so it is no surprise that he has come up with a Classic winner in his first crop…” John Berry, TDN, 15th Nov.